Scottish Highland Dancing is a celebration of the Scottish spirit. The dances are a spectacular combination of strength, agility, movement, music, and costume. 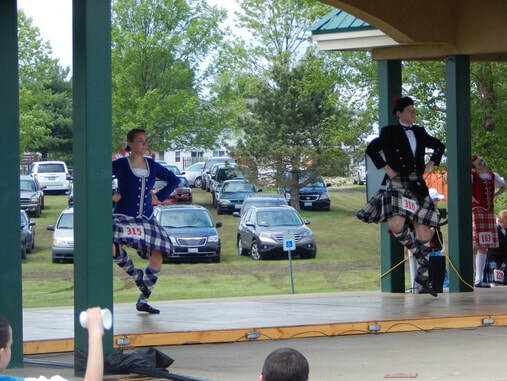 Unlike other dance mediums, Highland dances are generally danced solo and in competition. Dancers typically dance to traditional Scottish music such as Strathspeys, Reels, Hornpipes, and Jigs all played by an accompanying bagpiper. The dances are made up of different parts, called steps and there are usually four or six steps to a dance. Highland Dancing was traditionally performed by men, often before battle or other military pursuits, but is now performed by men and women. It is one of few arenas where men and women compete equally. In most competitions, the number of women competing far exceeds the number of men. Highland Dancing is a healthy workout for adults and for children. It is a great way to develop good coordination, posture and overall muscle tone, not to mention aerobic capacity and strength. Ambitious new students develop self-discipline and confidence as they learn to tackle the physical demands of Highland dancing. Indeed, the tremendous strength, stamina, and technical precision that accomplished dancers exhibit on stage comes from years of independent training and collaboration with experienced teachers.